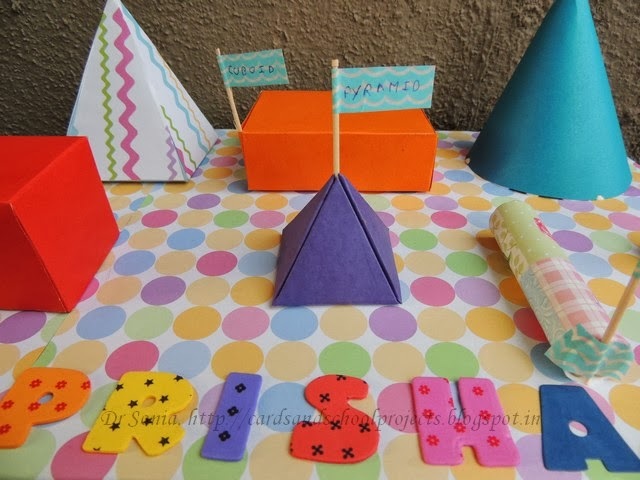 But I must say it was fun making the 3 D paper cube, cuboid , cone and pyramid. I had once before made a Pyramid for a food pyramid school project but hadn't bothered to blog about it as I felt it was so simple.My hubby's aunt is a school teacher and recently she told me how she had struggled to make a food pyramid for her students as there were no easy tutorials on the net on how to make a pyramid. Glue- Fevicol MR is my preferred glue. A glue stick wont work and avoid runny glue. The easiest pyramid is made from a square of paper! 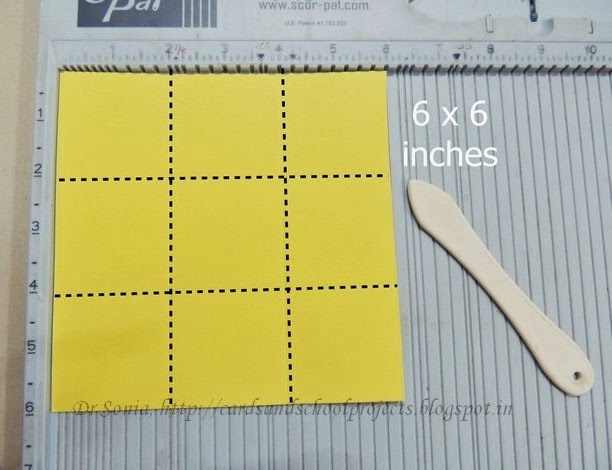 I started of with a 6 x 6 inch card .Scored [means take a ruler and run a blunt pen along]it every 2 inches one side first, turn 90 degree and do the other side. Choose any size of paper and divide it into 3 parts.So its easiest to work with a paper measuring a multiple of 3 eg 6 inch, 9 inch, 12 inch etc !! 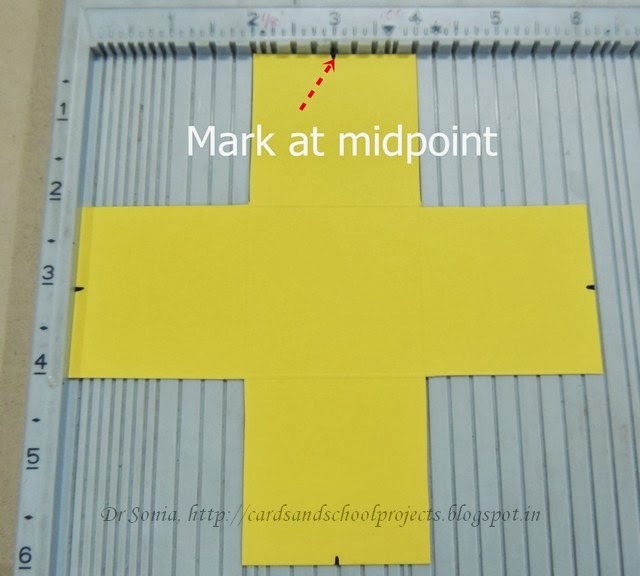 Score from the marked midpoint to the base corners of the outer squares as shown. 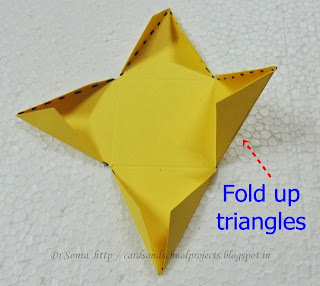 Fold in all the flaps at the score lines and now you have triangles around the base square of your pyramid. Next fold up all 4 triangles and you have a 3 D paper pyramid! If you are working with kids its highly likely your pyramid will have lots of glue smears..mask the mess by adhering pattern paper like we did for one of our pyramids! 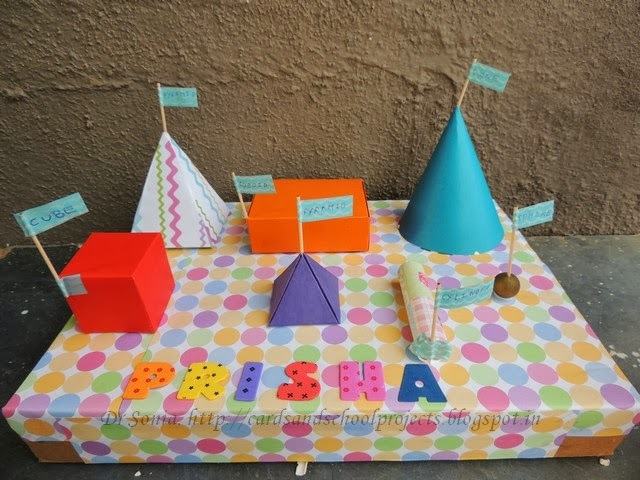 We stuck washi tape on toothpicks and my little one wrote the names of the shapes on the washi tape[ a gift from Priya].The "Prisha" was made by die cutting foam. 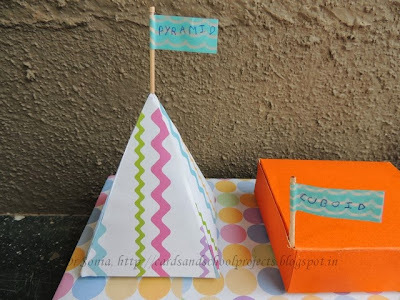 I know for the seasoned paper crafter making a pyramid may be an easy task but I am sharing our pyramid tutorial for all the kids , harried moms and hardworking teachers to make school projects a tad easier!! I really need to thank you! This is a fun way to learn the shapes. Like her idea for use of the washi tape. Hubby actually made a pyramid using wood blocks for a Master's Degree Business class couple yrs ago. We have it in our backyard. Melissa a wooden pyramid must have been so time consuming!! Hats off to your hubby!! A brilliant and very clear tutorial. Thanks for sharing. Hugs Mrs a. It's funny she picks the difficult cuts but the projects always turn out awesome!!! Just goes to show how well these learning projects are doing for her! She's an intelligent young lady!!! I'm proud of her and those 3D cuts look fantastic but I love her name letter cuts!!! Great job and thanks so much for sharing! You make me smile Audrey and the die cut letters were cut with the Donna Salazar dies. They are so useful for school projects. 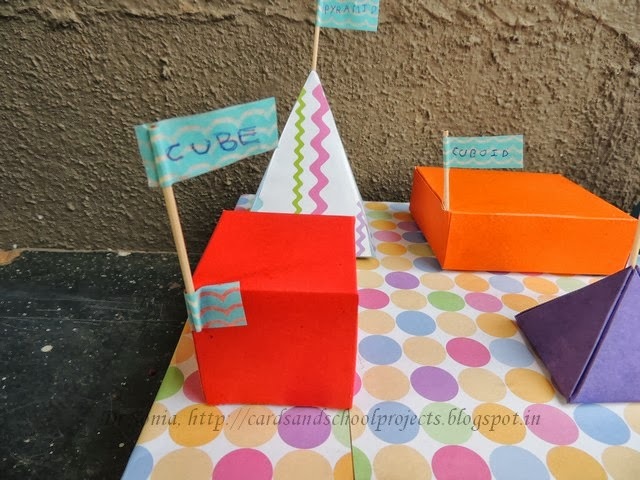 Wow..this is so easy...Loved it..Thank you so much for sharing..I too have finished some school projects last week..
Creative mom and daughter...very cute project. This is awesome. What a fun way to learn about shapes. Loved your daughter's idea of using washi tape. There is so much to learn from the young ones. Yes Sharanyaa..I was so stunned when she suggested we write the names on "flags". 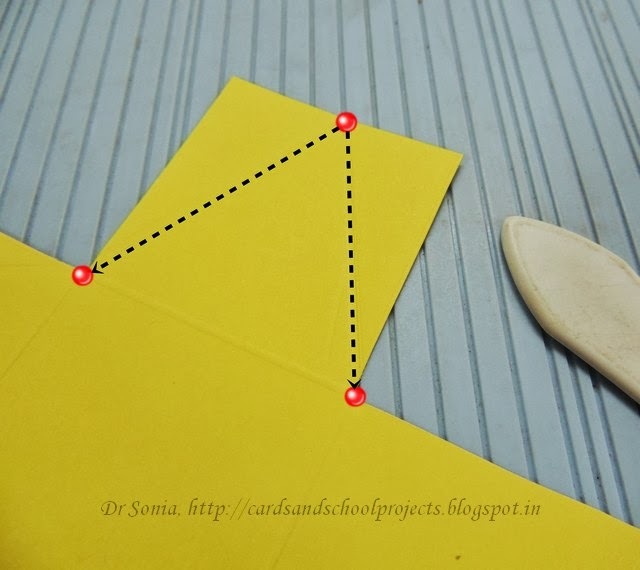 you are a super mom, Dr. Sonia.. 3D model is a nice and practical way to learn about shapes!! Thank you so much Shirl...she is a mutlitalented child and I am lucky to have her! An awesome project- how cool is it that your 7 yr old is so crafty- we call that "A chip off the old block"...or she gets that from her Mother : ) Awesome view of how the pyramid is created- Thanks for sharing! Ha Ha yes Shelly she is a true mamma's girl!! hi, Dr Sonia! The projects looks fantastic and reminded me some castle when I first looked at the photo :) You can make a whole city with these shapes! Ha Ha you are so kind..a multicolored and multi shape castle!! WOnderful Project ! 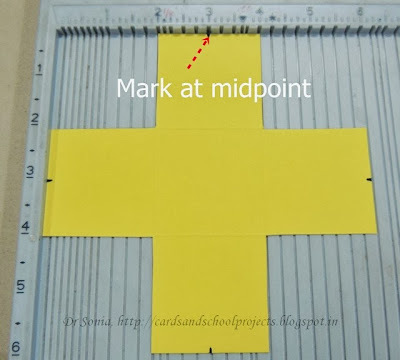 Its very interesting for kids as most of the images in textbooks are 2D and with project like this they can learn the object properties very quickly and that too with fun ! I loved how you have edited the photos specially the triangle ..its very easy to follow with visual hints !! Thank you so much Pooja. Yes the solid shapes topic is a bit confusing for little ones!! Oh thats so good to hear Ayushi. I always get my daughter involved in crafts and especially for her school projects. She can use the scoreboard, the guillitone paper cutter and even the big shot!! Oh yes Ann in fact we made a christmas tree decoration with it..will share it soon! Thank you so much for dropping in and always taking the comment to encourage! Super fun project...loved the letters used to create ur daughters name...!! A beautiful piece of work! cool project Dr Sonia ... Thanks for sharing pyramid tutorial..love to hear that prisha used to some craft tools that's great..one thing i must say under your guidance nothing is impossible.. Thank you so much Radhika....yes my little one is quite the crafter and a big critique too!! Wonderful project! Great job on all of the shapes! Love the polka dots too. Thank you so much Ruchi..the color scheme is my kiddo's!! Great way for your daughter to learn shapes, plus I'm sure it was very much fun to do together. Thank you Sonia for reminding me of my school days when internet was not at all a knowledge base. As my mom was a maths teacher she helped with making 3D shapes. I am so proud of my mom when there was no helping tools for making these. Every school year , my maths teachers used to contact my mom for some projects in Maths. Even now after these years of her retirement, many schools still approach her for projects.. Feeling so close to my mom.. I think in future I can share this bond with my daughter Mishael who is just turning 2 on Oct 25th. Lija I am so glad my post brought such fond memories for you!! We did have a lot of fun making these shapes. And a 2 year old surely will be a bundle to handle right now isnt it!! What a fabulous project .... it is wonderful and the explanation of making a pyramid. I'm impressed... love it. Thank you so much Sathya. I did the tutorial just cos of my hubby's aunt !! She's so lucky to have such a creative mom! It looks like a lot of work! Thank you so much Eileen..and its quite easy...I just took a lot of step by step photos!! Prisha is so lucky, I should say Dr Sonia. And I like the tip you've given for using an alternative for scoring board :) Use of washi tapes is a pretty idea too., well done Prisha! Well done Sonia!. Thank you so much Sarah...I am lucky to have a child who loves to create stuff with me! Hello my friend!! I've missed you while I was gone!! I couldn't wait to stop by and see what crafty goodness I missed while I was gone!! And as always, you didn't disappoint!! What an amazing project!! Your daughter is so talented, like her Momma!! The shapes are fabulous...as is the tutorial!! I love her washi tape flags!! So creative and awesome!! Thanks for sharing such an important school project and its learning process is very easy. In accordance with the new European Data Protection Laws (GDPR) do understand that by commenting your comment, name and other details such as website link will be visible to all who visit this blog . Handmade Foam flowers and Published !! Recycling Crafts -CD case notebooks again!